If you have a tablet or smart phone, then you have probably downloaded the free game 'Flappy Bird'. If you want to keep the super basic, yet couch-slappingly-frustrating game, make sure to not delete it from your device! As of Sunday, Feb. 9, it is no longer available in either the Apple or Google app stores. Now, iPhones that have already installed the most thumb cramping game ever are being sold for thousands of dollars on Ebay! I can call 'Flappy Bird' a success of mine. But it also ruins my simple life. So now I hate it. I thought a pair of $245 Nike shoes designed by rapper being sold for upwards of $10,000 was ridiculous, but this absolutely takes the cake. I came across two Apple iPhones that, at the time of this post, have each garnered 50+ bids and are being sold for $60,800 and $90,000! No, I didn't incorrectly add any 0's to those prices. Tens of thousand's of dollars for a device that you could get for just a couple hundred with a new contract. Insane. Especially considering a quick search through the online auction site and you can find a device for exponentially less. A tweet from Flappy Bird developer Dong Nguyen, said [sic] "I can call 'Flappy Bird' is a success of mine. But it also ruins my simple life. So now I hate it." and when asked why he 'hates' his success, "...because how people use my game. They are overusing it." It is probably a good idea for Nguyen to bow out while he is ahead considering the free app is pulling in $50,000 in sales just from the in-game advertisements. Eventually the unmistakeable likeness to the world of Nintendo's Super Mario would have gotten the attention of the video game giant. The Vietnamese developer continued, "I also don't sell 'Flappy Bird', please don't ask." Instead, that will be left up to the people willing to gouge idiots willing to drop stupid amounts of money for a (once) free game. UPDATE: The two phones that I talked about in this article have both been taken down, but there are dozens of phones at a buy it now price of $10,000. Out of control! 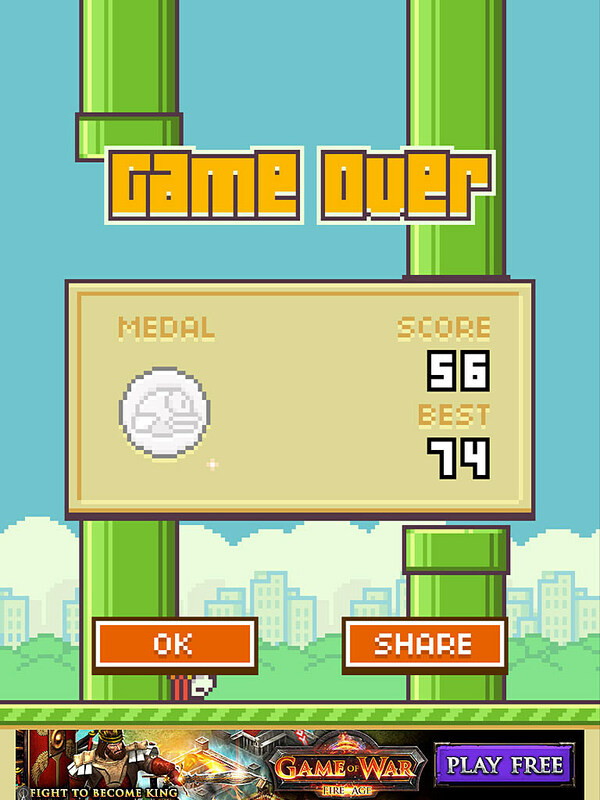 SideNote: My Flappy Bird high score is 74. Got a better score (without the 999,999 cheat)? Post a screenshot of it in the comment section below!